I had the distinct pleasure of flying to Hilton Head, SC last weekend to watch one of my best girls, Andrea, marry her prince charming. Ah, the beach, with its perpetual sand, sun, water and fresh air is a perfect recipe for a vacation to relax and reconnect with the earth. In fact, 72% of Americans prefer a beach vacation according to a poll by ABC news, and that number increased to 83% when families had children under the age of 18. So why is this? Well, there’s the obvious benefits to going to the beach including epic sandcastle construction, finding the best seashells, burying people in the sand, surfing and splashing in the water. But did you ever stop to think that maybe this is the only time that you’re barefoot outside for any length of time? “Toes in sand.” Google that phrase and over 16 million results pop up. Say it to a co-worker and they’ll have a thirty second escape, daydreaming about the warmth of the sand on their naked feet. It’s no coincidence that Americans’ favorite spot to revive themselves is with their bare feet on the ground. Anatomy of d’ feet. Your feet are totally awesome, in case you didn’t know. You have 28 bones, 107 ligaments, and 19 muscles and tendons which provide a springy effect that stores and returns energy with each step. Commonly, when you have a foot, knee, or hip problem, someone may recommend to you that you need arch supports, custom orthotics, or super stability shoes to control the overpronation of your foot. 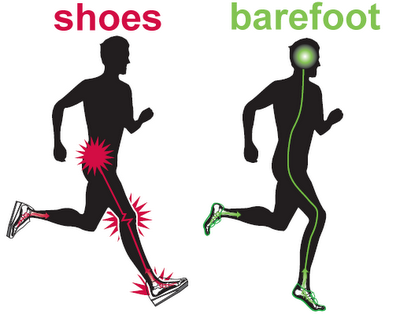 Overpronation is common when we don’t strengthen our feet and we confine our feet to modern shoes. Let’s consider this for a moment: When you break your arm and wear a cast for 6-8 weeks, the muscles in your arm are nearly non-existent when you remove that cast. They have atrophied, and it takes a significant amount of time to rebuild your strength and your muscle mass via physical therapy and exercise. Now, apply that same principle of muscle atrophy to the foot. If you support your arch in the foot with an arch support or custom orthotic, the muscles in the foot no longer have to do their job because they are held up by that support. They will begin to atrophy even more, leading to weaker feet, increased overpronation without the artificial support, and increased injuries. If any other muscle was atrophied in the body, we would strengthen the thing, right? So why then, in the case of a wimpy, weak foot do we tend to rely on an artificial support instead of utilizing the powerhouse foot to its full potential? Shape of the Foot. Dr. Ray McClanahan is a local podiatrist in Portland, OR as well as one of my personal heroes. “Dr. Ray,” as I’ve heard his patients affectionately call him, is a proponent of restoring natural movement in the lower extremities by encouraging proper footwear and the usage of his rad creation, Correct Toes. These images can be seen on the NW Foot & Ankle website. One of my favorite items that Dr. Ray discusses is the shape of a newborn baby’s foot. We were all born with beautiful feet, feet which are widest at the toes! By taking a glimpse at modern footwear, you would never know this with the narrow toe boxes and curve to the shoe. And guess what? Our feet become deformed as we stuff them into these narrow shoes, causing our big toe and pinky toe to turn inward leading to bunions, crooked toes and an endless array of other foot impairments. We can just call them by my favorite umbrella term “Toeliosis,” a nod to an awesome clinical instructor in Waitsfield, VT. Dr. Ray discusses the shape of the foot and encourages natural movement in this video. When the feet become deformed by the use of modern footwear, we run into the problem of “overpronation” as well. In one of my favorite Dr. Ray videos, he demonstrates how when the normal foot shape is restored by bringing the big toe back out into proper alignment, “overpronation” is virtually impossible. This is incredibly fascinating, as so many of us are wearing improper shoes and suffering from the results in the form of foot, ankle, knee, hip and low back pain. When barefoot or in proper footwear that closely resembles the shape of the foot, this allows for normal functioning of foot mechanics. Therefore, the foot becomes stronger and the rest of the kinetic chain is much happier. 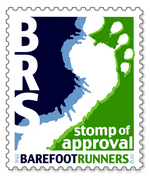 Dr. Ray’s website also has articles by Dr. William Rossi, another podiatrist that discusses the benefits of being bare. Here is a link to those articles. Obviously, the easiest way to connect to the earth is just by stripping off your shoes. There are other devices called grounding pads or earthing pads that exist to mimic the connection to the earth, and they are being used by athletes and us regular folks with chronic pain to increase energy and speed healing time. Needless to say, I totally want one! Afterall, I have more energy after a barefoot run than I do all day driving around in the car. Another pseudo fact is that the NASA space program was using a device called a Schumann Resonator attached to their ships when they send their astronauts out into space. I say “pseudo fact” because I have yet to confirm this with NASA, it seems they are too busy to answer my silly questions… they must be doing something more worthwhile I suppose. Or doing nothing at all, since my husband just reminded me that NASA is no more. Rumor has it that the astronauts that were going up into space were becoming quite sick when away from Earth’s precious frequency and only returned to their normal state when reconnected to the ground. The solution was to send this device that emits the Earth’s frequency with the astronauts on the ships, and this seemed to solve this problem altogether. Great! So, could it be that we feel rejuvenated after a beach vacation because we’ve had our happy feet stuck in the sand and reconnected ourselves to Earth mama? One full week of Earth’s healing effects to try to propel us through the next work week. Perhaps that’s why we feel the post-vacation buzz linger for a while after we get home. Now imagine connecting to the Earth daily via a barefoot run or walk, and consider the lifelong benefits. I apologize, I’ve had this picture for so long that I’m not sure of its origin. Anyway, when we attach a cushioned heel to our shoe, it takes away our profound ability to feel the ground like when we’re barefoot. In search of feeling the ground, we land harder to try to feel the surface with the eyes (nerve endings) of our feet. One of my favorite studies that was featured in the book, Born to Run, was the gymnast study out of McGill University headed by Dr. Steve Robbins and Dr. Edward Waked. They found that the thicker the mat, the harder the gymnasts landed, theoretically in search of the stability of the ground. This could be directly related to the thickness of our running shoes! The thicker the heel and foot cushion, the harder we land, seeking out the stability of the firm ground. When heel striking, we disengage the natural marvel of the foot’s mechanics during running. When hitting midfoot/forefoot, we activate the springy effect of our bones, muscles, and tendons which absorb the shock from the ground, store that energy and release it with power to propel us forward. When hitting at the heel, we absorb the shock up through the bony heel, which has no way to dissipate that shock. Therefore, the shock travels from the heel to the knee joint to the hip joint to the back and on up. This is the very reason why my injuries became more frequent when my shoes became thicker and more cushioned, with a price tag to boot. I always liked that saying, “to boot.” What does that mean, anyway? Take a look at the two pictures above again and you may notice how the heel striker would be the less efficient runner as his heel is acting as a braking force, impeding forward propulsion. On the other hand, the forefoot striker will continue to glide along easily, as the foot is hitting underneath his center of gravity and his body will continue to propel forward. This results in a smooth, easy ride and the storing of energy for use later on during a long race, just when you need it most. The heel striker may tire out quicker with all the stopping and starting, leading to the infamous bonk. 5. The Pelvis. For me, the position of my pelvis is one of the most important aspects of running injury-free. When I was in physical therapy school, we learned in our neurology class how the position of the foot can impact the position of the knee and therefore the pelvis. If we put our foot into plantarflexion, (pointed toe like a ballerina) even slightly like in a high heel or traditional running shoe, this creates a knee extension moment. In otherwords, when your foot is in a high heeled running shoe, the knee will have a tendency to be locked out straight. This also results in anterior rotation of the pelvis. Translation: Your booty sticks out and the curve in your low back increases. You seen them booty runners? It’s ok to laugh a little, it’s funny. I’m allowed to laugh because I used to be one. This rotation at the pelvis creates total disconnect between your upper and lower body because the core musculature is imbalanced and can’t hold everything together. This is a disaster, because much of our power, balance and forward propulsion should be coming from strong stomach, back and hip muscles where our center of gravity lives. Additionally, your quads and hamstrings which are attached to your femur and your pelvis, are wildly trying to recruit and activate at a bad angle resulting in injuries all the way down the chain due to shortened quads and overstrained hamstrings. Hello hip and knee injuries! The Dr. Rossi article has a nice picture of what happens to the pelvis in high heels in Fig. 1. Contrarily, when the foot is in dorsiflexion, (bringing the toes up towards the nose) this creates a knee flexion moment, or bent knees. Have you ever seen someone walking around in ski boots? To my knowledge, there aren’t any running shoes on the market that put your foot in dorsiflexion, but there are some walking shoes. But this video is just pure entertainment, and you can see how this would not be a favorable running position either. When barefoot, and with a little postural reeducation for those of us who’ve been sticking our booties out for a long time, the pelvis can be restored to its neutral position. The pelvis can truly be the center of power for your stride and I never even realized this until I began running bare. I will talk about how to properly position your pelvis in my next post, which will be the “how to” section. 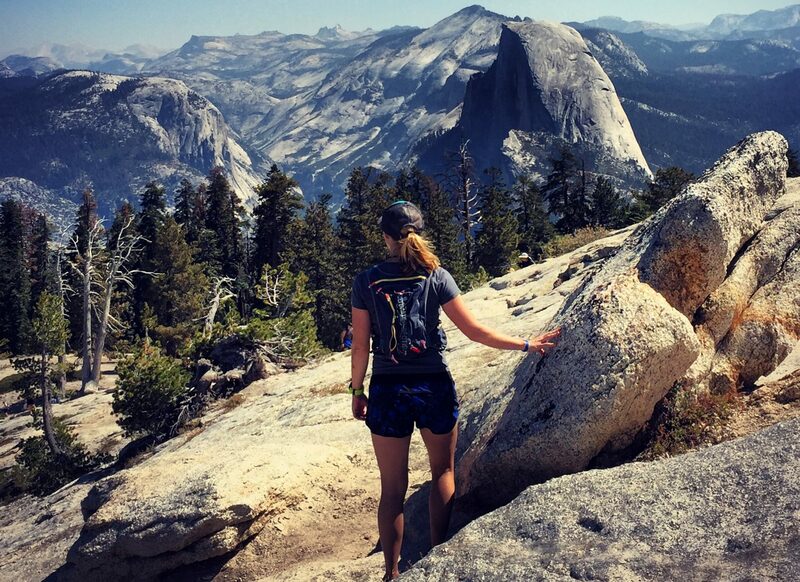 In closing this post, I want to reiterate that running barefoot not only reconnects us to our Earth mama, but we begin to feel the connection between us and others as well. Thinking back to the races I’ve done over the years, I only really began noticing other people when I took away the inch or so of rubber beneath my feet. When you’re closer to the ground, the energy that you feel not only comes from Earth, but also from the people surrounding you as you all vibrate along at the same frequency. I can honestly say that I never had much of a desire to run with other people before, but now that I am the way I am, you can bet that if you ask me about running, I will invite you to run with me. My running buddy, Christy, and I were talking last night about the effortless conversation that flowed between us the day that we met, which also happens to be the day we did a 19.5 mile trail run together. My husband and I have run for miles through the woods together without saying a word, appreciating the quiet solitude yet connecting to each other through the ground that we tread upon. So whether or not you have a beach vacation planned, take off your shoes and get your feet on the ground! Through running and reconnecting to the ground, we can improve our overall health and wellbeing. I’ll leave you with links to a couple more articles: How Humans Ran Comfortably and Safely Before the Invention of Shoes and Running Shoes May Cause Damage to Knees , Hips and Ankles.